This is the story we'll live with for all of Lent: Jesus spends 40 days fasting in the wilderness, where the devil tempts him to give up, to prove himself, and to turn from God. Jesus does not. Instead, he quotes scripture. During Lent, every Sunday worship here at Advent will dive deeper and deeper into this Gospel text. Seeing as it's the day before our first Sunday worship in Lent, I thought we should start getting comfortable in this story. It's Matthew 4:1-11, by the way. 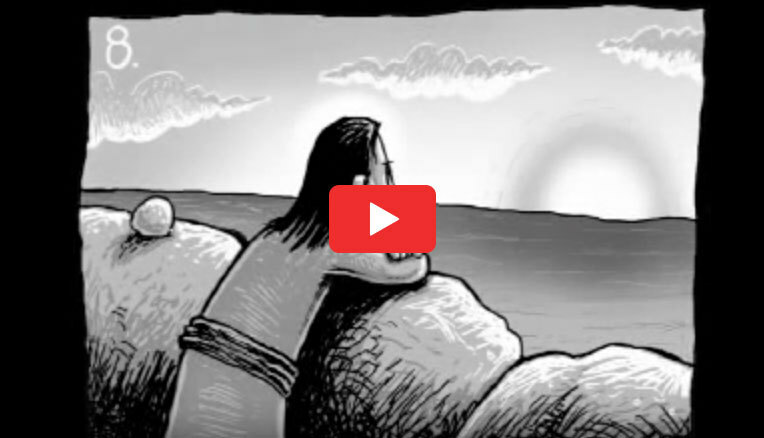 In today's devotion video, Youtuber Adam Young takes 40 incredible illustrations about Jesus' 40 days in the wilderness, by a British illustrator named Simon Smith, and puts them to an Explosions In The Sky song. It starts slow, but keeps getting more and more powerful. Enjoy! p.s. How is your preparation to use less water starting Monday going? Let me know, or share in our Facebook group. p.p.s. We're having a vegetarian/vegan potluck at Advent tomorrow at 12pm! Great opportunity to prep for Week 4 of our Carbon Fast when we are giving up (or reducing) our consumption of meat! Come join! Find a small way to love creation today. Water your plants at home with extra care and love, like it's a joy, not a chore. Pick up any trash you see in the park. Or spend some quality time with your dog, cat, or other pet.